Some may ask why even the need for this type of section let alone filter. Because we have spent so much time looking at the needs of adults and the filtration needs of adults, we have seriously overlooked the needs to our vulnerable - our CHILDREN. Whilst we have spoken and shown the visitors to our site, how in our water supplies there are so many detrimental chemicals virtually killing us, we have not stepped back and shown parents how to best protect their kids from the over chlorinated, over fluoridated waters we drink and bath in. Currently across any given Australian City or Regional towns, the waters we drink and bath in contain no less than 35 chemicals in the water, hard to believe but that is a given, some cities contain much more. Of those 35 chemicals around 6 are filtered, and even the water board expresses they can't really filter our much more, and toxins are in that group of UNFILTERED water. So next time you turn on the water and bath your newborn or baby even your toddlers, imagine all those chemicals they are bathing in, taking into their small bodies, and even drinking. Well there is a simple method to stop your child from bathingh in all those chemicals, and using one of our Shower Filters, we will show you how simple it is. Step 1: 2 Hose Clamps - this can be purchased at any hardware store, we got our nice little clamps from Bunnings as it has the clip to tighten. 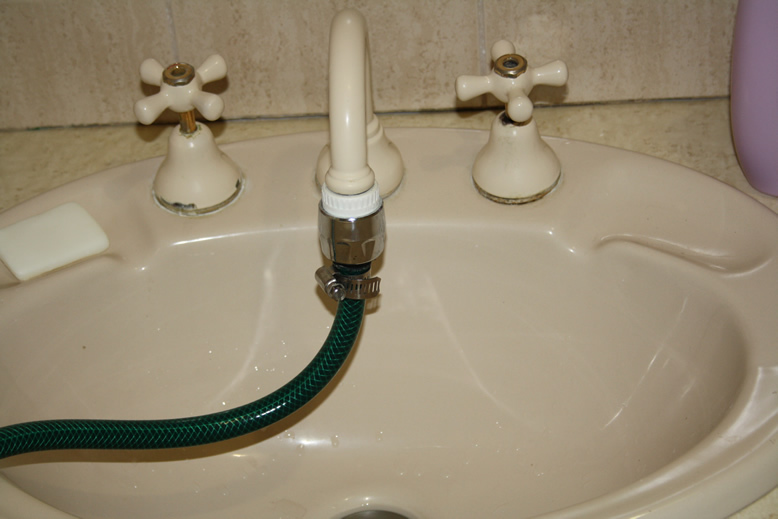 Step 2: Garden Hose, estimate the distance from your tap to your newborns bath tub give or take, be generous with the hose. Step 4: Phat Water Shower Filter. 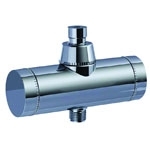 Now connect from your Sink Tap fittings, to see what will connect to your basin tap and what will connect to the shower filter. Heat up the hose alittle so you can slip on those attachments make sure you have the hose clamps on first. When the hose is heated and connections attached, use your hose clamps to make sure the water pressure will not make those connections slip off. Now connect your shower filter end, same method, heat up the hose, slip the right connection on for the shower filter end, and clamp it when done. Now you can bath your newborn in the knowledge that they are being bathed in filtered water free of chlorine and fluoride. If you wish to use the filters in your bath tub, but don't have a threaded tap in your bath, then use this same system on your basin and drop the filter with the hose into the bath tub and use the basin as the fill up point. The images below are for illustration purposes only, should you wish to custom make the filter for your specific purpose you can call us directly for help. You can see the Sink to Tap fittings from Bunnings and the hose and clamps can fit generally all sinks. Again this is perfect to moderate the bath temperature for your newborn. 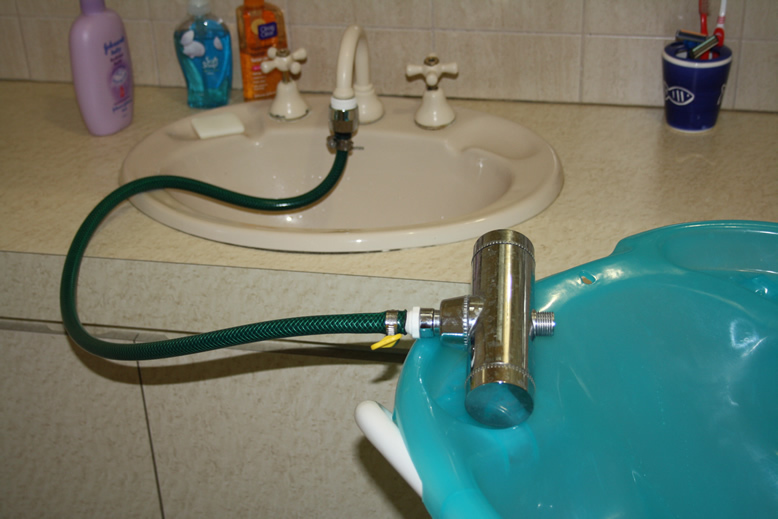 As you can see the shower filter is connected to the tap via the hose and clamps, thus allowing you to fill the babies bath easily and with pure water, this same method can be used to fill the bath tub is no threaded tap on the bath. Once finished the connection on the tap can be easily removed as it is a click on connection.